Is your team stressed out? Did they just complete a big project? Need to develop trust, communication, and collaboration? Sometimes, meetings and instruction is not the answer. Every team or organization needs a break sometimes to refresh basic teamwork skills or to just have fun to raise morale. JTF will design activities for your time frame and/or need. JTF will bring our equipment - you can choose to play the traditional games or we can design a program just for you. Challenge your employees to exciting drills where teamwork, communication, and collaboration is key to winning the challenges. JTF has a truly unique brand of activities to give your employees a great experience. We will work closely with you to design a program that best fits your needs. "JTF has worked with our staff two times this school year. 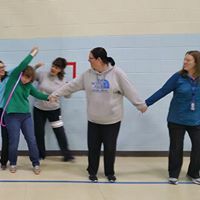 We worked on communication skills and team building all while completing fun activities. I highly recommend their services if you are looking for a fun way to help your company or organization have some fun." To discuss a team building event, please email at jointtrainingfacility@gmail.com or call 240-284-4000.